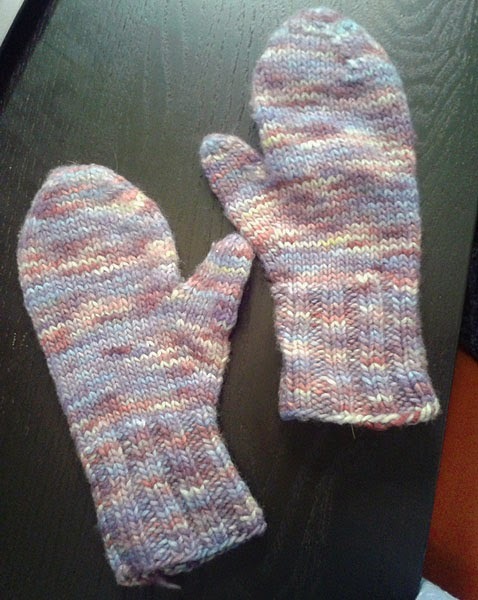 My first pair of mittens! I was cold a lot in the beginning of winter, so I felt it was time to make myself a pair of mittens. Gloves don't do much to keep my fingers warm, but these work amazingly! My new MSD size doll has majorly inspired me to knit for her. I found a pattern on ravelry for a hoodie and had to give it a try. Here I was beginning the kangaroo pocket on the front. Rosslyn helped me make Rania (my doll) a masking tape sewing dummy and we stuffed it with plastic bags from the grocery store (my way of recycling them). It helped a lot in do the fittings part of this project. 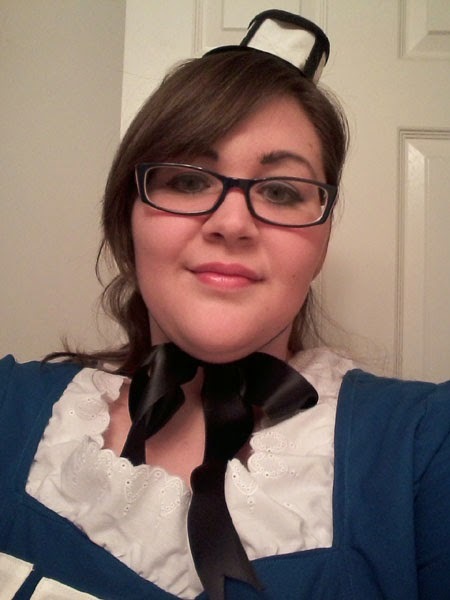 Here I was beginning the collar at 3:30am. I had to teach myself intarsia to add the different color around the collar and hood edge. You can see the intarsia here on the backside of it, the looping of each color of yarn around each other like a chain going vertically up. Doing both sides of the collar now. This was the middle of knitting the hood, which is larger than the body of the sweater in some ways. Dolls have big heads, man. I weaved in the ends as I went so I wouldn't finish the project and have a ton of ends to weave in...and promptly cry. Awhile back, my mom gave me a large amount of broken jewelry of hers to repair. One of those pieces of jewelry was a long string of garnet beads (real garnet) that my father's stepfather had given her (this grandpa was a geologist). The string had broken and she had gathered as many beads as she could find. I restrung the necklace and brought it back, only for her to tell me she'd found six more beads. So, I offered her a pair of earrings to match the necklace, which she'd never had. She took me up on it. My mom doesn't like dangly earrings all that much, so I had to come up with something simple and not too long, or she'd never wear it. I opted on a simple cluster of three beads each. I think they turned out rather nicely. She was very happy with them, too! It's high time I gave you all a tour of my working space! I also do my schoolwork in this room. 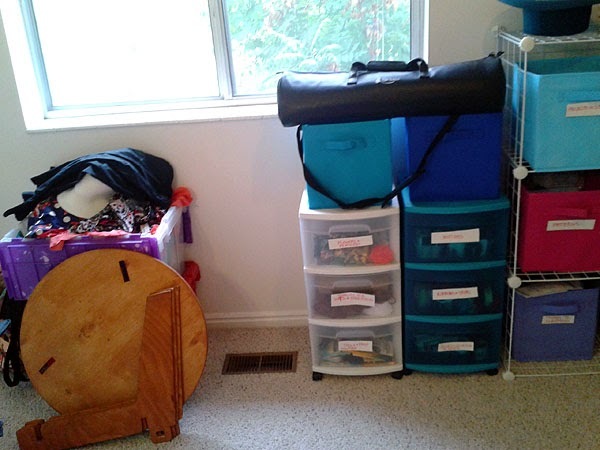 Starting over in the far corner of the room, my labeled bins, my mending pile, and my medieval flat folded table. Also, you can see my doll bag sitting on some empty bins. A little further over, though the pictures on the wall have changed. There are now three. All of these pictures are of Steam Powered Giraffe, my favorite band, and they are also all autographed. I love them! Turning the corner, there's the filing cabinet, my art and knitting books, my old sketchbooks, and journals and other items I use with my creative thinking. On top of the shelving unit is my doll, Khorae, and a gazebo I made myself for the tiny dolls. And, here is the desk space! You can see bead sorting in process there and my water mug. There's also my yarn ball winder and the Harry Potter wand Rosslyn made for me. This is a project I've had on again off again since I moved to the Frozen North. 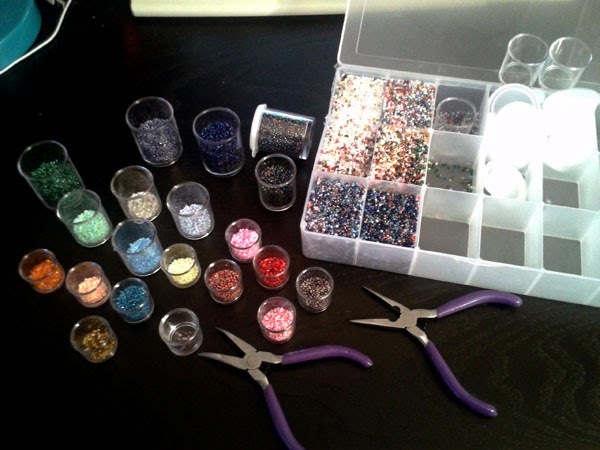 When I moved, I packed up all of my supplies in what I thought were impregnable boxes with dividers that would keep my beads separate. Boy was I wrong. My seed beads, the tiniest of them all, moved from their divisions (they didn't fall out of the box, thank goodness), and mixed themselves up. Since then (over two years, nearly three), I have been sorting them by color and type. This is a very long, drawn out process, but it is a nice thing to do when I have nothing specific on my plate. I'm nearing the end, so I'm hopeful that this will be done very soon. Yes, the pliers are there for a reason. 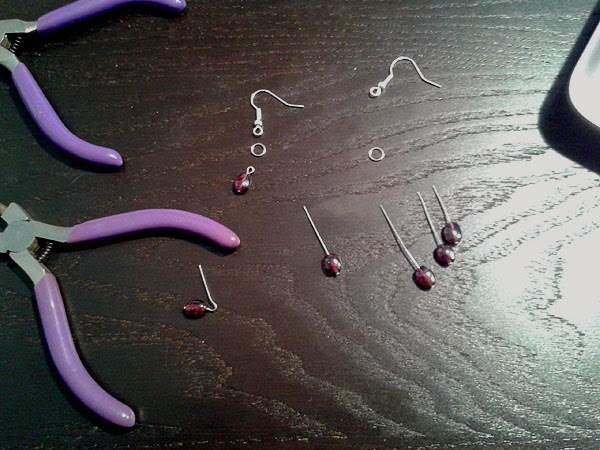 I use them to pick out specific beads as my fingers are too clumsy to be effective. This past year, my husband and I decided to do a Doctor Who theme for Halloween. He opted for the tenth doctor...and I had options. I decided to be the eternal companion, the Tardis herself. I grabbed my two best friends, Camilla and Rosslyn, and we got started. We took a dress of mine and used it for a base. I'll be honest right now and say that the drafting was done by Rosslyn, with assistance from Camilla, and the sewing was done by Camilla. I did the finishing (hemming and adding the eyelet lace) and ironing in between all the steps. In the end, I also managed to make a little fascinator that could light up! I ironed on the notice on the door, but you cannot really see it in the shots below, sorry. Sister's Christmas Gift: Tardis Socks! 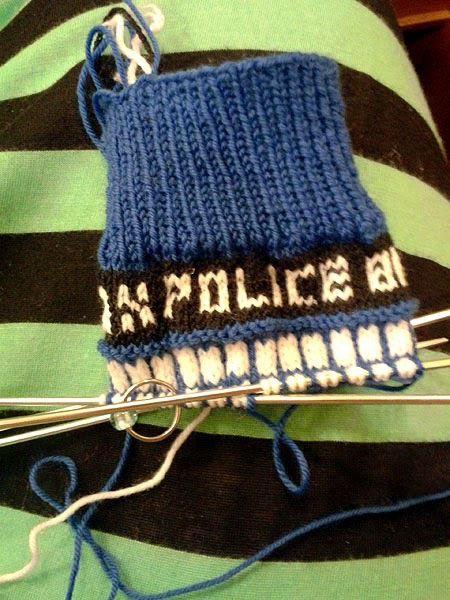 Two years back, my sister asked me to make her Tardis socks after seeing the ones I had made myself. I finally buckled down and made them for her. She got them on and they fit her feet, for which I was very glad. But the colorwork ended up being rather tight, so she had to fight to get them on. Still, she seemed mostly pleased with them and they do look very nice. 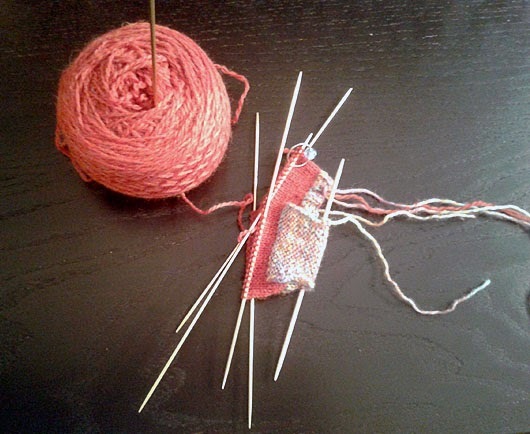 I have got to work on my gauge when I do colorwork. I mentioned these in my last post. This is the Holly Berry Roving, unwound from it's braid. I started with this, pulled it apart for ease of drafting and began to spin. I ended up with five very full spindles (the pictured amount is about half full), which became five small skeins of single ply yarn. There's one of them. I prefer the look of single ply yarns, so I didn't want to ply it. I don't have any in progress shots, but here's a good look at the finished product! I made a lot of them. At least ten. Given my medieval hobbies, it was only a matter of time before I began to spin my own yarn. I spin using a hand spindle, and this white wool was my first attempt. I had an awful lot of it, you see. This was an experiment. 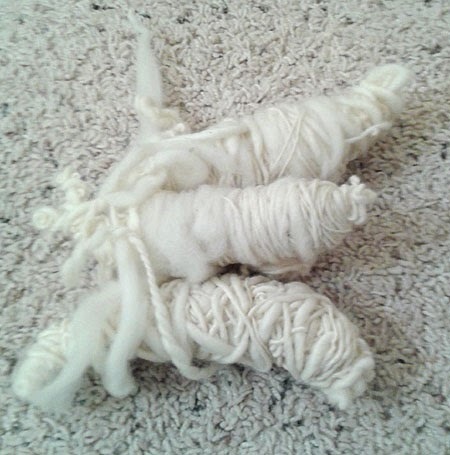 Camilla had made a roving out of threads and thrums, and I spun it, then plied it together with some of my white wool. Another experiment, Camilla made pink roving from thrums and I added a small batch of rainbow roving I'd already spun, plying them together. 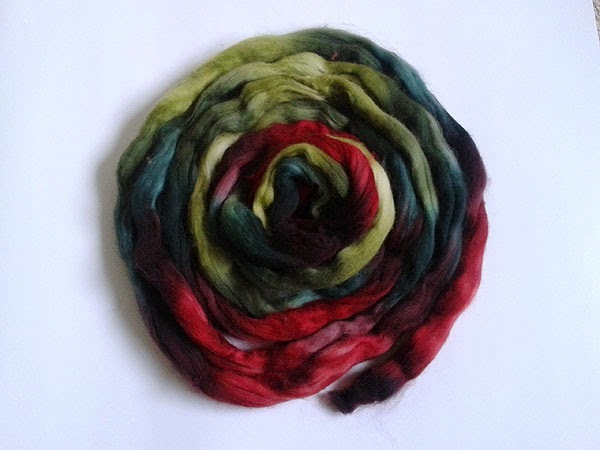 I spun this, still early on in attempting to spin. I decided to take my spinning a little more seriously and bought a couple pigtails to practice with. The pink one began to show some uniformity in weight. The aqua one was much better. Both were practice for this one, the Holly Berry. I used it to knit tiny little Christmas stockings for family. You also get to see my tool of choice, my hand spindle! It's a very nice one, smooth and light weight.